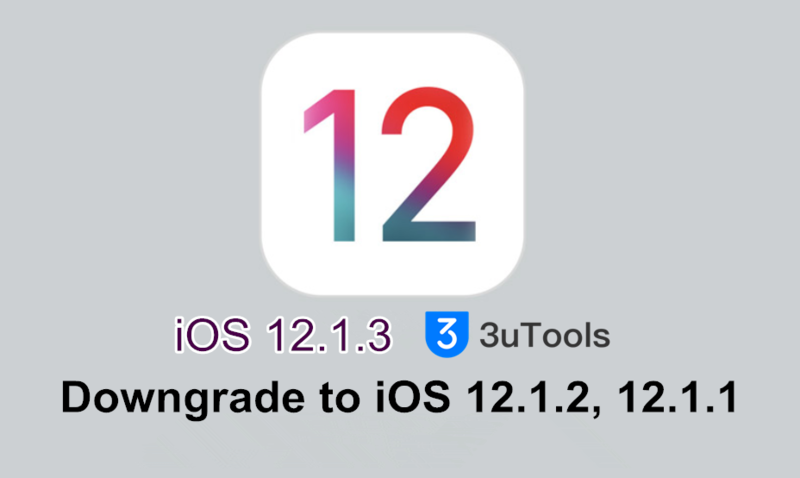 After releasing iOS 12.1.3 earlier this week with a few minor bugfixes, click to upgrade iOS 12.1.3 in 3uTools. As Apple still signing for iOS 12.1.2/iOS 12.1.1 versions, here's you can downgrade from iOS 12.1.3 on our iOS devices the right way. Please customized back up your important data on your device at first. Step 2 Navigate to Flash&JB →Easy Flash, and select iOS 12.1.2 or iOS 12.1.1 firmware. If you want to save your data, you can select the checkbox "Retain User's Data While Flashing". (But flashing with data may probably cause failure.) Then click "Flash". Step 3 Keep a good connection and internet while flashing, wait patiently for around 5 to 10 minutes. Your device will be downgraded to iOS 12.1.1/iOS 12.1.2 after reboot. How to Downgrade iPhone 4 from iOS7 to iOS6.1.3 without SHSH Blobs Using 3uTools? How to Downgrade iOS 11 Final Back to iOS 10.3.3 Using 3uTools? 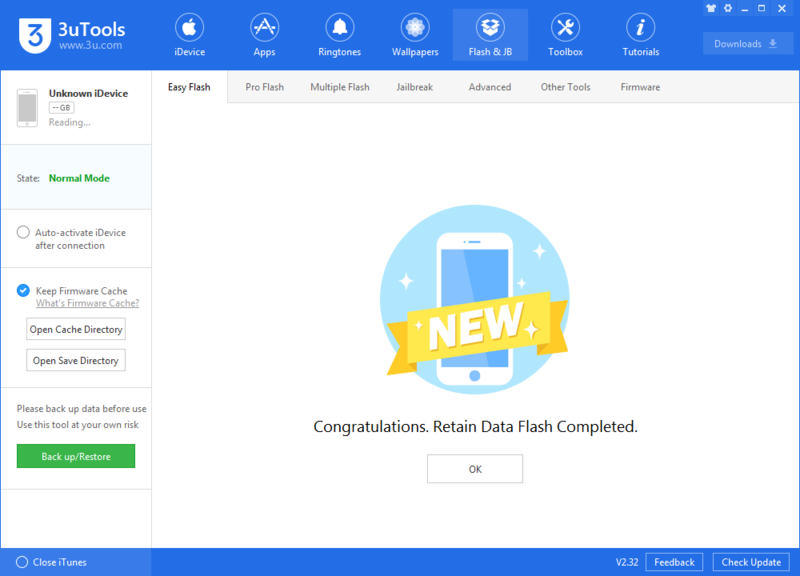 3uTools Supports Downgrade iPhone 6s to iOS 10.3.3 from iOS 11 3uTools Flashes iOS4.0~iOS11 in Easy Mode Tutorial How to Downgrade iOS 12 Beta, iOS 11.4 to iOS 11.3.1? 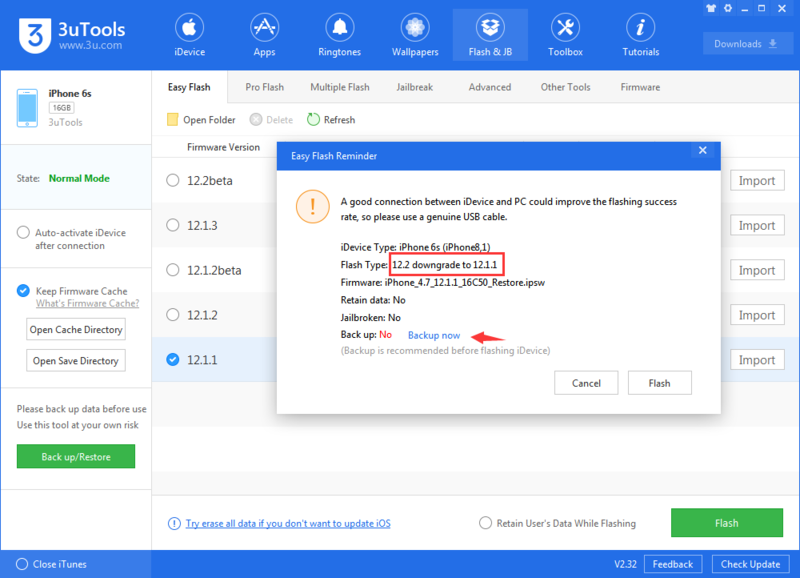 How to Downgrade iOS 12.0 to iOS 11.4.1 on 3uTools? How to Downgrade iOS 10.3.3 to iOS 10.3.2 on iDevice? How To Downgrade iOS 10.3 To iOS 10.2.1 Retaining User’s Data?